1988 1987 Don Meade, U.S.A.
1982 1981 P.J. Gannon U.S.A.
1976 Gerard Danaher, Co. Sligo 1975 Rick Epping, U.S.A.
in the Missing names, corrections etc. Thank you, Dave Hynes. Recently I took it upon myself to organize the 1st. 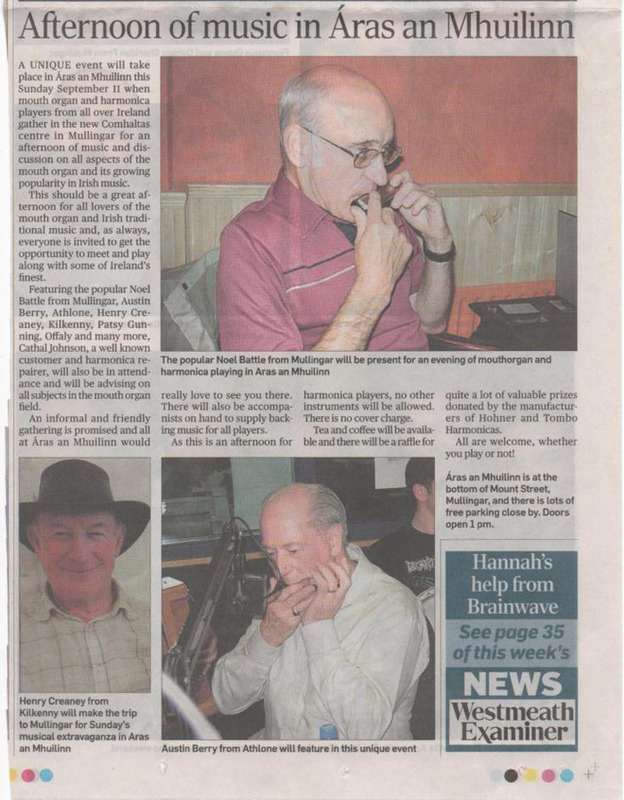 ever harmonica convention/ get-together in Mullingar, County Westmeath Ireland. 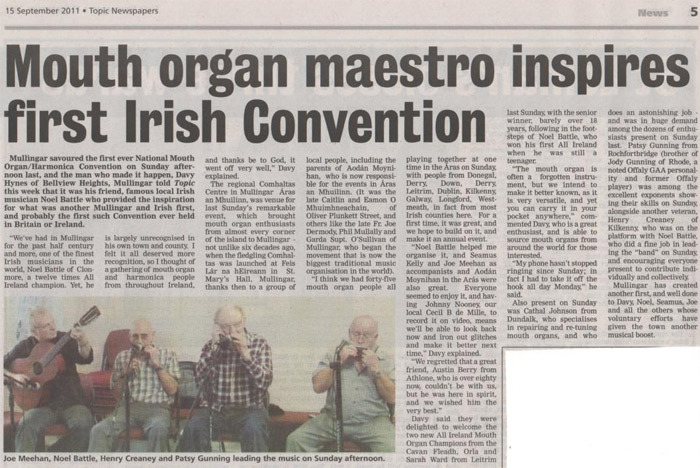 This, I am glad to say proved very successful in that up to 50 harmonica players turned up on the day. Almost every County in Ireland was represented, with the age of the participants ranging from 11 years of age to people in their 70's. It was a very enjoyable day and most iluminating. Looking back on the function now, I have assembled the following facts for your perusal. 1. All of those in attendance were traditional Irish harmonica players. 3. 2 people played 10 hole diatonics and only 1 person used a chromatic. 4. I intend to try and make this an annual event, because I have had many emails and texts from interested people from almost everywhere, expressing interest. 5. Fortunately, the event has been recorded to dvd, and is available on this website. 6. Although an attendance of 50 people may be regarded as relatively small for a convention, I think it is only fair to point out that what we may have lacked in numbers, was overcome totally by the quality of the music on the day. If one were to type in Irish harmonica into any search engine, you are very likely to come up with the same names every time. This is a welcome fact and you are most likely to learn a lot about Irish harmonica. We all gather inspiration from the playing styles of Rick Epping, Brendan Power, Mick Kinsella and many more superb players who are the premier exponents of the chromatic and 10 hole diatonic in Irish music. In Ireland, Tremolo, octave and 10 hole diatonics are referred to as Mouthorgans. The tremolo harmonica is the most favoured of these. Chromatics, chord, Bass, and sometimes 10 holed harps are referred to as Harmonicas. All traditional Irish mouthorgan players consider the "richter" tuning as being totally useless because the entire scale is required over all octaves. Irish tremolo players use 1st. position (the key that the mouthorgan is in) at all times, although some have the ability to play in 12th (lydian) position, but they are not purposefully aware of this and of course playing in the relative minor to the key comes naturally. The 10 hole diatonic harp would be the second choice of the Irish trad. players. These are mostly used to great effect in slow airs. In the past few years these 10 hole diatonics are beggining to gain in popularity due to the work of that great innovator Brendan power, with the introduction of his "Paddy richter" tuning. Another example of the 10 hole diatonic in Irish music is the Steve shaw cd. Steve is a superb player of Irish traditional music on both the 10 hole harp and the tremolo. In Irish traditional music the two most important keys are D. and G. Of course all 12 keys are suitable and eventually the players come to recognize that a paticular tune sounds better and more interesting in a particular key. This is very evident in the playing of the great Noel Battle, Mullingar, Austin Berry, Athlone, Henry Creaney, Kilkenny and the Ward sisters, Leitrim, and many others who use the tremolo harmonica. If you can whistle a tune or sing a bit of a song, the chances that you can play traditional music on the Mouthorgan are very favourable. I would recommend that you would begin with a "hohner echo celeste" or a Tombo 3121. the key of the harmonica is not important at this stage because if you can play a tune in one key, the same tune can be played in any of the 12 keys available. Please bear in mind that the keys of D, G, A, AND F are probably the most popular in Irish music. Practice playing DO, RE, ME, FA, SO, LA, TEE, DO. to begin with. Move on then to playing some very simple nursery rhymes and tunes such as "Jingles bells" etc. 10 minutes of practice per day is enough. This will build up your "muscle memory" and very soon you should find that you are able to tackle and play some nice slow tunes. Do listen to the cd's of the very excellent Mouthorgan players which are available on this website. This will inspire you to move on to more intricate tunes. Above all DO HAVE PATIENCE WITH YOURSELF. Learning the Mouthorgan does not happen overnight. Another great way to learn is playing some tunes with other people.